Gift Certificates are now available from our online cigar shop and pipe tobacco store. Rated 92. A pressed cigar with an oily, chocolate brown wrapper. A good draw imparts a good balance of earthy, creamy flavors. The spicy finish hints of brown sugar. Oliva Cigar Co. has considerable tobacco stocks, and its Serie O brand is made with Cuban-seed leaves from the three major growing regions of Nicaragua: Jalapa, Condega and Estel�, where the cigars are rolled. Rated 94. The smoke is delicious, with a salty, earthy flavor punctuated by tasty dried cherries and hints of cocoa and cedar. Rated 91. It's an earthy, woody smoke with a pervasive sweet spiciness. Made with an authentic African Cameroon wrapper, this unique blend is medium bodied. All long filler Nicaraguan fillers and binder are used to complement this specailly aged wrapper. Robusto. This Cameroon cloaked robusto is one of the company's best. The toothy African leaf pairs well with the sublime Nicaraguan tobaccos that make up the filler blend and binder. As part of a redesign of all of the company's brands, the cigar was originally rated as the Oliva Grand Cameroon, but is now known as the Oliva Serie G Cameroon. The blend remains the same, Cuban-seed Nicaraguan tobaccos mixed with Cameroon wrapper. The box-pressed robusto, which measures 4 1/2 by 50, is elegant and sweet, with nice balance. Rated 91. Rated 91 by the Cigar Insider. This box-pressed torpedo takes on a distinct array of rich woods, spices, breadiness and a dense, almond paste finish as it smokes. Body: Medium. Oliva Cigar Co. of Miami Lakes Florida makes millions of cigars each year in Nicaragua, but none are finer than its Oliva Serie V Liga Especial. The brand is made by a small team of rollers in Nicaragua-only 22 are entrusted to make it, and unlike the other cigarmakers in the factory they are paid on salary, rather than by the number of cigars they make. Furthermore, Oliva uses some of its most powerful leaves in the blend, which is finished with a Habano-seed wrapper leaf grown in Nicaragua. The result is a full-flavored cigar with balance and complexity. An Oliva Serie V has made our Top 25 list for five years running. This is no small feat, and it speaks to the cigar's admirable consistency. Rated 95 & #3 Best Cigar of 2017. Ten years ago, Oliva Cigar Co. released its Serie V, which was the strongest, most full-bodied cigar the company ever created. But it was also impressive in its ability to render layers of richness and complexity in spite of its power. Ten years later, we found ourselves with the same excellent product. It�s difficult enough to maintain such quality and consistency, but even more of an accomplishment when you consider this: Oliva has been acquired by a larger company. In 2016, Oliva Cigar was bought by European cigarmaker J. Cort�s Cigars N.V., who wanted a premium brand in its portfolio. Naturally, there were concerns about the Oliva cigars changing and quality suffering. Luckily for the cigar-smoking world, J. Cort�s kept Oliva president Jos� Oliva on board after the acquisition, to help ensure that quality was maintained. So far, the change has been seamless and the Serie V remains remarkable for its ability to convey high volumes of flavor, especially at such a low price point. The blend is centered around strong, ligero tobacco from Nicaragua�s Jalapa Valley and a high-priming wrapper to complete the taste profile, which is rich in earth, leather and spice though balanced with a sweet touch of molasses. Rated #22 Best Cigar of the Year 2011. 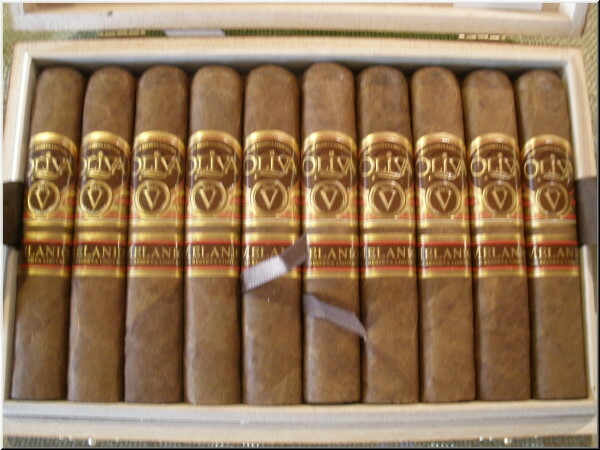 The Oliva Serie V Liga Especial Double Robusto is a nutty and spicy cigar, complemented by notes of vanilla and cloves. An impeccably constructed cigar with great oils and rich color. The draw is perfect, imparting significant earth and coffee bean flavors that linger on the finish. Huge, thick and oily with a richly colored wrapper. It draws and burns well for such a thick cigar, showing a steady profile of woody, nutty and coffee flavors, although the finish is short. Rated 89. This attractive, oily torpedo is full of dynamic nut, wood and sweet cedar flavors that frame a substantial leather core. The finish is long and rich. Tasty and complex. Rated 94 by Cigar Aficionado. 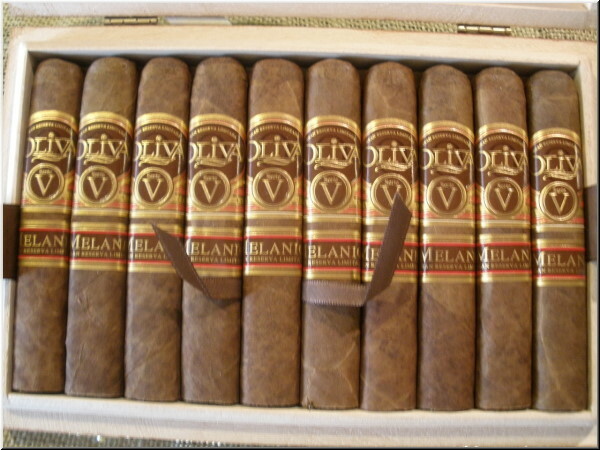 The Oliva Cigar story began in the late 1800s, when Melanio Oliva started growing cigar tobacco in Cuba. His heirs carried on the family tradition in the fields, but it was his grandson Gilberto Oliva Sr. who began making cigars. As with so many cigar stories, Gilberto Oliva Sr. faced a difficult road. He left his native Cuba in 1964, and eventually started working for the Plasencia family in Honduras. 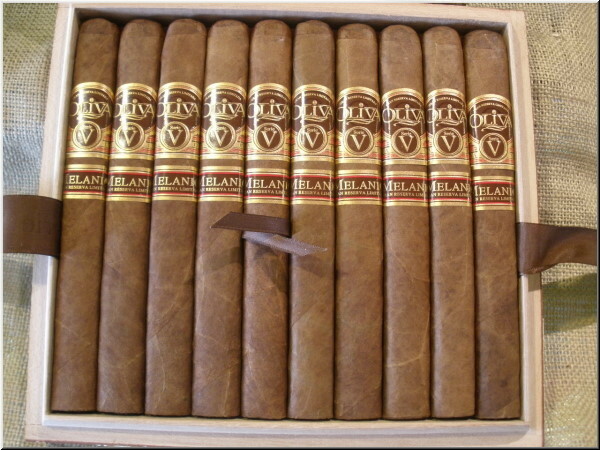 In 1995 he and his son Gilberto Jr. created a cigar within Plasencia�s factory called Gilberto Oliva. A year later, they set out to open a factory of their own, and shortened their brand name to Oliva. Business was tough in those days, and Oliva struggled. Faced with dwindling reserves of cash, in a cost-cutting move they turned to Gilberto Sr.�s robust stocks of Nicaraguan tobacco, which changed the flavor profile of Oliva cigars at a time when the interest in Nicaraguan flavor was increasing. 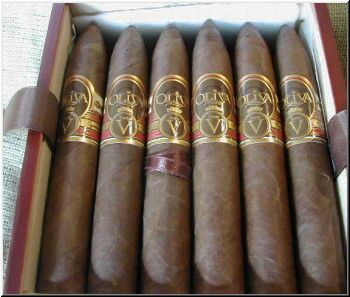 Nicaraguan tobacco helped Oliva survive. 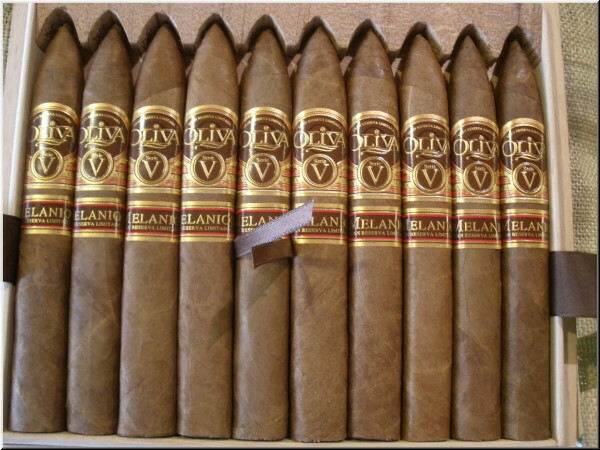 The cigar that brought it to the attention of connoisseurs debuted in 2006: Oliva Serie V. Made by a small group of rollers and blended for strength and style, the Serie V line was an immediate hit. 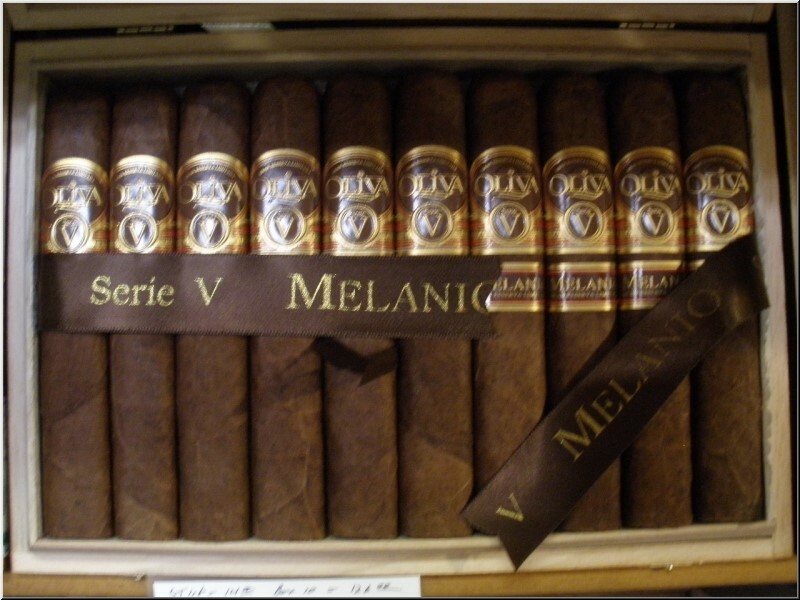 In 2012, to pay tribute to the first man in the family to grow cigar tobacco, Oliva added the Melanio version, which is distinguished from the original by its Sumatra-seed wrapper grown in Ecuador. Rated 90. Wood and floral notes dominate this long, well-made cigar, which has a silky-wrapper. The burn and draw are both even and consistent. Rated 92. A gorgeous, box-pressed toro gorda with a superb wrapper. This cigar is complex and flavorful offering floral notes and hints of rich, malted nougat. Rated 96 and Cigar of the Year #1 of 2014. The Oliva Serie V Melanio Figurado has rich, big notes of leather framed by a range of coffee, caramel and woody intonations. It�s a classic smoke. Rated 89. Notes of semi-sweet chocolate and caramel come through this tiny, box-pressed cigar. The draw is sub- stantial and the finish imparts notes of walnut. Rated 94 points and #8 Best Cigar of 2016. Many will remember that the Oliva Serie V Melanio Figurado was named Cigar of the Year in 2014. The brand continues its trajectory of excellence with the Robusto. It�s a far more compact format, and perhaps more approachable, as not everyone is inclined to light up a large double figurado as their everyday smoke. The blend is centered around a Sumatra-seed wrapper grown in Ecuador paired with Nicaraguan tobacco. This combination isn�t terribly common in the premium cigar world, but the Oliva Cigar Co. seems to understand the tobaccos and how they fit together for harmony and balance. The smoke is silky, sweet and, at times intense with toast and cedar. 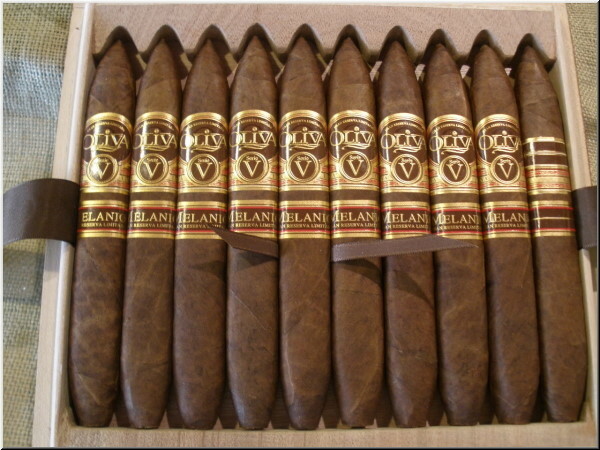 The brand name commemorates Melanio Oliva, who first grew tobacco in Cuba in the 1800s. Rated 89. Spicy notes of leather and dried citrus complement this cigar�s strong mineral base. The wrapper is oily, and the draw is full. Special Orders and deposits on Special Orders are not refundable. Sales of ALL tobacco products listed on this site are prohibited to minors. We thank you for doing business with El Fumador Cigars Pipes & Tobacco. You must be 18 or older to purchase any tobacco products. HOURS: 11:00 A.M. - 7:00 P.M. Eastern Time Monday-Saturday. Closed Sundays & Holidays. Pennsylvania State Sales Tax will be added to all purchases shipped into Pennsylvania. Recipients of any products outside of Pennsylvania are responsible for their own state and local taxes.